This mosaic was made from 2500 individual photographs of circles, photographed by 542 talented individuals. 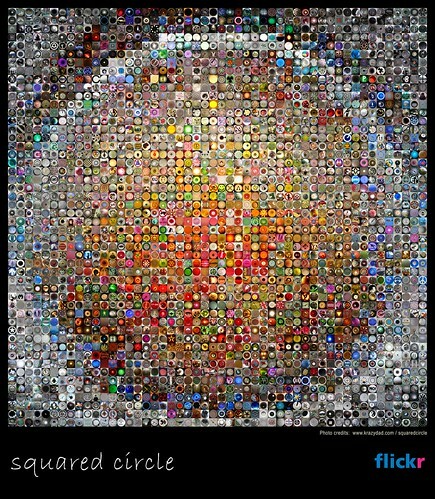 The mosaic was constructed algorithmically by Jim Bumgardner using images from the Squared Circle photo pool at Flickr, the photo-blogging website. Each individual tile in the mosaic is a unique photograph of a different circular object. Here's a closer view of the mosaic. Click on a tile to see the original photo. Thanks to Andrew Wallace for helping with the map! This poster is sold out.